Most people who stop attending church services still believe in God, according to new research commissioned by the Church of Scotland. Many who no longer attend church choose to express their faith in new ways, said Scotland's national Church. The findings contradict the assumption that a lack of belief are the main drivers behind falling congregations. 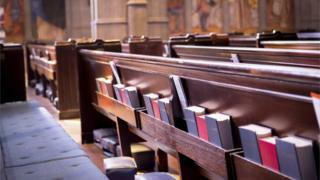 The Church of Scotland has admitted that the research conclusions are a challenge to the way it is organised. Until now, the decline in people attending church services has often been laid at the door of either growing disbelief, or disagreement with positions on issues such as women's participation, or sexuality. Their research, carried out in stages over three years by Dr Steve Aisthorpe, draws a different conclusion. It says that two-thirds of church leavers continue to have a strong personal faith, and many practice it in different ways, such as gathering in small groups to pray or discuss theological issues. Venues can range from people's homes, to cafes and restaurants - or even just a shared activity like walking. Two thirds of those questioned said they felt they did not fit in with the established congregations they had left, and many did not want to join a new one. The study poses a challenge for churches which place large group services at the centre of their worship. Dr Aisthorpe, who is employed by the Church as a mission development worker, said his research, which began in northern Scotland before growing to encompass the whole country, did not distinguish between different denominations. "This is a big change. People are moving away from institutional forms of worship, and expressing their beliefs in other ways". He believes that the issue for leavers is not as simple as being unable to find a church, or minister, that they personally like. There also appeared to be no difference in the findings from rural and urban areas. Where then, does this leave traditional church services and the clergy who perform them? Revd Norman Smith, vice-convenor of mission and discipleship for the Church of Scotland, said the role of religious leaders was changing. "It's less of an old-style, one-man show now. It's more about working as a team, a minister assisted by volunteers. "We need a variety of churches. A large number of people still find their home in traditional churches. But the nature of the gathering space has changed." The National Secular Society says the report is not a surprise. Spokesman Alistair McBay believes arguments over sexuality, for example, have turned worshippers off. "The key issue is that these individuals are reflecting a great deal of disaffection with organised religion. "Churches are out of step, and the people in the pews are voting with their feet".